The Western Ghats in Maharashtra start from Baglaan range. This mountain range is situated to the north of Nasik district, near the border of Nasik district in Maharashtra and Dang district in Gujarat. There are 2 distinct mountain chains called Selbaari and Dolbaari. Dolbaari comprises of Salher, Mulher, Mora, Hargad and Salota forts, whereas Selbaari comprises Mangi-Tungi and Nhavigad. Nhavigad is also called Rantangad (not be confused with Ratangad from Ahmednagar district). On the way to the top, we can find water tanks and a temple. The steps are still there, but the entrance has been completely destroyed. The fort has a narrow apex, almost like a pinnacle. To reach to the topmost part, some natural vertical climbing is needed. It takes around half an hour to see the fort. There are 3-4 tanks on the fort and remnants of some houses. 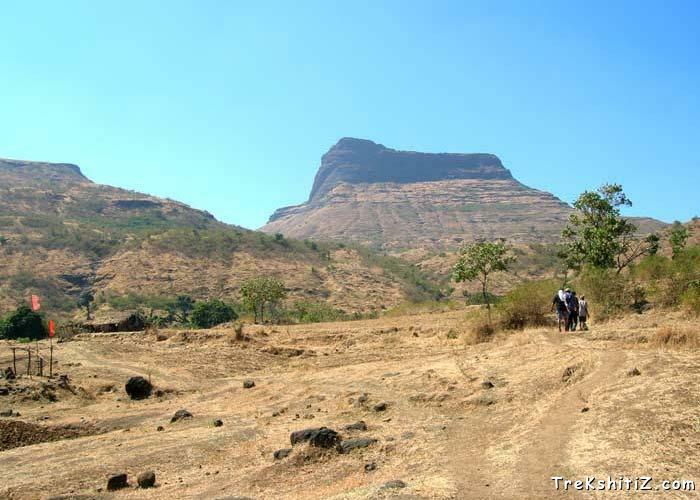 To visit the forts in Baglaan, we need to reach Taharabad in Nasik. For Nhavigad, we have to reach Mangi-Tungi village from Taharabad. From here we need to walk to Vadakhel and then to Pataalwadi, which is the base village. This takes more than around an hour and a half. From Pataalwadi we reach to the plateau of the mountain, from where 2 ways go to the rock steps. One is a straight way towards the top point, bit steep and tough ascent. The second one turns around the pinnacle and reaches the steps. The water tanks are found on this way. Since there is scree on the steps, one has to be careful while ascending. It takes around one and half hour to reach the top from Pataalwadi.